Established in 2008, AnyOption is one of the pioneers in binary trading industry. It is owned and operated by Ouroboros Derivatives Trading Limited and regulated by CySEC (Cyprus Securities Exchange Commission). The company is licensed under the CIF as 187/12. Technically, the clients of the company enjoy the benefits of CySEC regulations as well as fall under the Investors Compensation Scheme that protects their funds. To help traders deal with the intricacies of trading AnyOption provides a comprehensive library of trading knowledge. With proper tips and pointers, new traders can easily trade assets at AnyOption. One of the first things that prove a website’s credibility is its geographical location. Sadly, AnyOption owners have neither published a valid business address, nor their contact number. This makes us wonder about the nature of their business. Knowing that AnyOption is regulated by CySEC automatically puts their customers under investor compensation scheme. In other words, should AnyOption fail to fulfil its contractual obligations, traders can always file their claims (up to a maximum amount of 20,000 euros) under the jurisdiction of Cyprus authorities. The website making it impossible to withdraw winnings. Abruptly closing the account without notifying them. Taking a long time to compensate their funds. The customer representatives being less helpful and rude. Operating from Cyprus hence, if a trader is from somewhere outside Cyprus, he or she can’t fly to their country to retrieve their money, should a problem arise at their end. All these factors reflect their poor business nature, hence the 50-50 rating. Since the website has earned mixed reviews on forums and review blogs, we recommend you to observe caution when dealing with the brokers. Read all the terms and conditions related to trading before you open an account with AnyOption. Unlike other brokers that use a standard trading platform, AnyOption uses a custom-tailored proprietary platform that has improved considerably since 2008. Their trading interface is precise, user-friendly, comprehensible and easy to navigate. It displays up to 4 different assets on ‘profit line trading mode’ that helps you monitor them with ease. This service keep customers updated by sending them SMS messages. “Bubbles” are circular dialogue boxes present on the right hand corner of the trading screen. On ‘Bubble trading mode’, the size and shape of the circular bubble corresponds with the potential returns on trades processed by them. A large bubble denotes low potential returns because there are greater chances of winning the trade and vice versa. The unique thing about ‘bubble trading mode is that it helps you control your risk-reward ratio in a creative manner. Dynamics: A brand new feature that decides if the expiry price of your trades is below or above the predefined value. High/Low Binary Options: A classic binary option that lets traders predict if the current market price of their asset will end up lower or higher than the current value, after the expiry of the option contract. Bubbles: They’re circular dialogue boxes that let you set your risk-reward ratio by manipulating its shape. One Touch Option: This kind of trading is available at the weekends only. The feature lets trader predict if the current price of their asset will touch its strike price before the expiry of the option contract or not. Option Plus: Option+ lets traders close their trades before the expiry of its option contracts. Long Term Options: These binary options operate same as High/Low options with the exception that the expiry period is usually longer. Now that we’re clear with different trade types offered by AnyOptions, let’s check out a set of rules laid by the website. One Touch Binary Option Trades take place on the weekends (that is Friday to Sunday), after usual trading hours. Since AnyOption is regulated by CySEC, they don’t offer any special bonuses to tempt their customers. Nevertheless, they do have the provision of compensating 15% refund, if your option expires out of money. We researched in this area, but didn’t find any details on AnyOption mobile app. Unlike other binary options brokers that offer multiple trading accounts—both live and demo, Any Option offers just a single account. Their standard trading account requires traders to deposit at least 250 Euros to commence trade. Like other binary options traders, the payout ratio offered by AnyOption depends on the asset type and expiry period. Nevertheless, the average payout percentage on High/Low trade is within the range of 65% to 71%. The maximum return is 71% so far. Expiry time is calculated on hourly basis. As mentioned earlier, the company is CySEC regulated therefore, it’s mandatory for them to get all user accounts audited from time to time. The funds kept in segregate accounts are treated differently from trader’s funds. Any Option is available in 13 countries. You can find the list of countries on their home page. The list may expand in future as the website is constantly expanding its trade on a worldwide basis. After studying AnyOption thoroughly, we conclude that despite having a novel trading platform, they still follow traditional practices. Compared to other brokers, they’re conservative in terms of trading. Nevertheless, they do provide helps to those who seek tips or guidance, which makes them a trusted brand. Then again, considering the negative reviews, you might want to stay a bit cautious while dealing with them. IQ Option—a well-known European binary options broker is owned and operated by the Iqoption Europe Limited group. The company offers great benefits to new traders, such as free demo accounts and a user-friendly IQ Option app that provides great tips. They’re based in Yiannis Nicolaides Business Centre at Limassol, Cyprus. The company deals in 79 assets including stocks, indices, commodities (silver and gold), bitcoins and currency pairs (AUD/CAD, EUR/USD, GBP/USD). 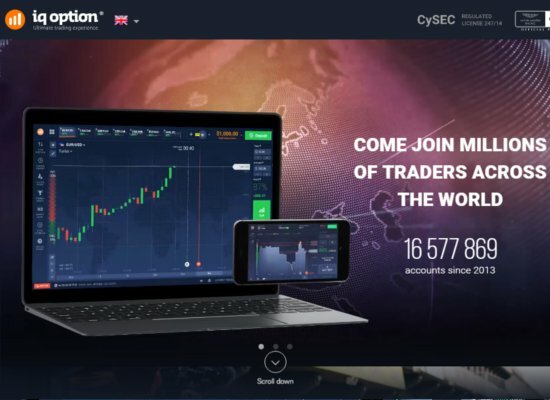 First-time traders seek complete information regarding a trading platform, bonus, deposit and withdrawal methods, login accounts, tutorial videos and payoffs. This review covers extensive information on IQ option and whether it’s a scam (it’s not, by the way). After extensive research, we conclude that IQ Option is a fair and transparent brokerage regulated by the CySEC (Cyprus Securities and Exchange Commission). Their license number is 247/14. Moreover, they’ve listed valid phone number (+44 20 8068 0760), address and email address (support@iqoption.com) on their ‘Contact Page’. Both their domains (IQoption.com and eu.iqoption.com) receive high traffic, which denotes that traders are satisfied with the company performance. The brokerage has very few complaints registered against them, which shows they own a solid reputation in market. Hedging: They actively manage risks to prevent huge losses for their traders. Customer Support: They’ve live chat options to resolve complaints and typically response within 24 hours. Trading Platform: IQ has developed a global platform to provide their customers quick access to financial markets. Their cutting-edge trading platform is used by the Spot Forex trading people. Refreshing user interface, sophisticated software and availability of four trading layouts (Bar, Area, Candlestick and Line) make it simpler and easily comprehensible. Traders can choose timescale for charts in 18 different intervals. You can use technical features for market analysis and drawing tools to plot trends on live charts. You can make multiple trades on a single chart—a handy feature for large-scale traders. Trade size ranges from £1 to £10,000. The site provides tutorial videos and demos covering different aspects of trading. They’ve wide-ranging tutorials that will help new traders build confidence. Keeping in line with the CySec rules, the firm dropped its deposit match bonuses last December. If IQ regulators are to be believed, such bonuses impose high risks. The IQ Option offers a seamless mobile trading experience to its customers via bespoke trading platform. Their app displays a spacious trading area with buttons, menu icons and detailed information. Their app is available in iOS as well as Android formats. There’s a special “IQ Option for Windows”—it works Windows compatible devices. The apps are available on Google App store and Apple Store. The company offers free demo accounts and VIP accounts for trading. Talking in terms of returns on investments, the company offers competitive rates on standard payouts. In normal conditions, on an average, traders get up to 91% payouts on a successful trade—the best rates offered in trading industry. The rates fluctuate on the basis of asset type and expiry period. The brokerage hasn’t set limits on withdrawal, but the minimum deposit limit is £10 for read accounts and £300 for VIP accounts. Users can make deposits and withdrawals via e-wallets, credit cards and wire transfers. Neteller, Skrill and WebMoney are most used modes of money transfer. Withdrawals take up to 1 to 3 days to get processed. The transactions get processed within 24 hours on weekdays. The clients need to use the same mode of payment to prevent money laundering. The company lays down strict anti-money laundering rules. Therefore, you need to provide relevant bank details to process your payments. As mentioned earlier, IQ option Europe Limited is managed by Infofield Premier Ltd (a registered organisation having valid registration number: HE324593). Their sister company Investlab Holdings Ltd is registered as HE327751. All operations of both companies are licensed by CySEC, which means the traders are protected under the provision of MiFID. Demo accounts work in parallel to any normal account with real-time deposits. They don’t have any time restrictions. 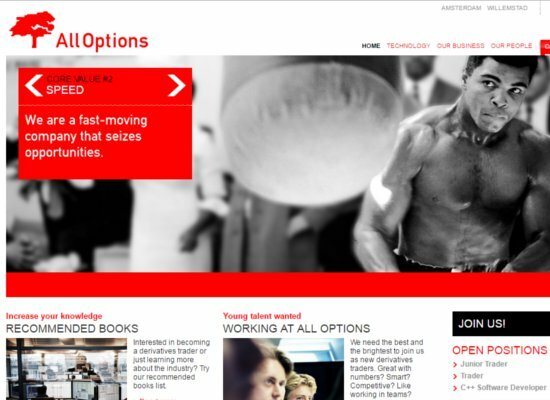 IQ Option provides a free demo account (no deposit) for traders to hone their skills. The account can be used on a long-term basis and a balance worth £1000 can be restored to it. You can run it alongside real money accounts. The most common advantage of a demo account is it allows traders to try new strategies and swap accounts without risking real money. It’s a risk-free, minimum-deposit offering. Probably this is why IQ option traders have grown in such a short time span. The registration and login process is quick. Users require an email Id for registration. Minimum trade is low (£1) therefore traders don’t have much to risk. IQ Option supports 13 languages: English, Chinese, Russian, Portuguese, Spanish, German, Turkish, French, Swedish, Indonesian, Italian and Arabic. In 2014, their trade kicked off with 18 countries. In just two years, they spread their operations to 178 countries around the world. Nevertheless, due to regulations on local laws, IQ trading is not available in Australia, Canada and US. They have a flourishing business in Europe, UK, Sweden, Germany and Asia, mainly in India, Thailand, Malaysia and Singapore. After a long time, we found a company which provides fresh real-time trading options. Their website, app or terms and conditions don’t look like a carbon copy of other companies. The trading platform supports live chat and information in 13 different languages. Their demo account and payout% is favourable. The login and verification process is quick and trading is hassle-free without any hidden shenanigans. Expiry of options is quick (they usually expire within 24 hours). They have a short list of assets, suitable for intra-day traders. Overall, the website seems like an excellent option for new option traders. As a pioneering platform Daweda Exchange excels in contract dealings. It is regulated by CySEC and belongs to Daweda Exchange Ltd, and has its location at Grigoriou Xenopoulou, 24 Nicosia – 1061 Cyprus. It offers its traders benefits by removing brokers so that there are no conflicts of interests. Also it offers very transparent and honest trading climate in which a trader can do his business with ease and without any distraction resulting into return maximisation. Is the platform a scam? 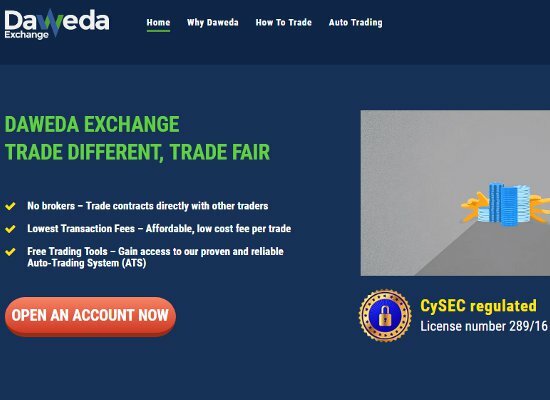 Daweda Exchange has many good features embedded into its system thus avoiding becoming a scam platform. Firstly by eliminating the complex network of middlemen it contacts directly with clients and at a nominal service fee of £0.50 chargeable from both the parties and nothing more in form of extra fee or any other form of commission. Secondly offering good amount of returns is another feature that makes it more attractive. By removing middle channels one may receive up to 100% as return if traded with success. Removal of middle level channels directly transfers their share of profits in your kitty. Third good feature Daweda Exchange offers is the complete control over the way you trade like setting your own price levels and the number of trades or contracts you want to have. In this process you can also view others offers and even create your offer. Fourth unique feature offered by the exchange is the simplicity which ensures transparent and fair trade contracts. An innovative order book created by the exchange enables to see at a glance various positions that includes Call and Put numbers that are available on current basis. This results into leaving more flexibility at your hand to take right moves. For binary option Daweda has created its own customised trading platform. The feature that makes it apart from other binary option brokers is the platform acts as exchange and as a result they trade charge $0.50 per contract. Variable expiry time options are 5 minute, 30 minutes, 1 hour, and end of the day. Their options are listed on all major Market indexes, Forex pairs, Commodities and Stocks. User-friendly trading platform makes the trading convenient. Anyone can choose Call or Put with the numbers. Minimum trade size of the contract is $10. And there is 100% return possibility on all the options. Also the exchange has created the Mobile trading app compatible both with iOS and android versions of phones to cater to wider client base. Their Demo account makes it easier to begin the trade without any fear of losing money. The difference between Contract trading and Binary option. The Binary option needs a broker and ‘options contract’ is between trader, broker and investor. Under contract trading, traders decide mutually the trade level and the amount of money they intend to invest. The other difference is while trading contracts on exchange, one can place an order through order book, and wait for the desired price level to appear. One can even hedge his investment by selecting a position in reverse direction of your original trade to protect your investment made initially unlike binary options. Choice of level and adequate control over trade as also the freedom to select the position. No chance of any slippage – If your order fails your chosen level and price changes, then it will return to the Order Book automatically until it is matched. Even when you are not in-front of your computer, advanced software technology developed by Daweda called ATS (Automated Trading System) trades for you. There is hardly any need to sit before computer to keep a track of market. The software ATS will automatically match your orders against the right offered price in the system. The focus of this software technology is to ensure that there are adequate profits but minimum loss. Daweda Exchange is a unique and reliable platform, created to offer the best experience to customers with the help of blend of customised innovation and industry oriented processes and technologies. The technology is customer friendly and created confidence in the trader. This cutting-edge technology ensures a perfect environment where even demanding trading sessions challenges can be undertaken. The speed this system offers is more than 100k messages per second and can process 150k orders per second to ensure that response has no lag time and is quick enough to minimise risk. Daweda has invested heavily to provide a customer oriented interface irrespective of the level of trade. By offering appropriate educational platform it has ensured that its customers can take right decisions with ease and confidence. Daweda’s customer focus enables it to keep innovating to keep its customers faith intact. Daweda App can be downloaded from stores like Apple and Google play. The App will ensure that you are in touch with trade even while on move. Absence of middlemen ensures that whatever money Daweda saves is passed on to clients to the tune of 100% upon successful trades. To ensure and infuse a sense of confidence among investors and their hard-earned money the company operates under strict EU regulations (EU license number is 289/16) that means you are adequately protected and can invest without fear of losing your hard-earned money. 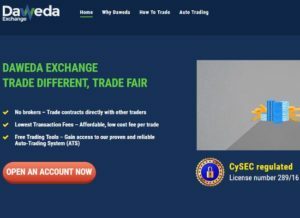 Daweda has a license from the Cyprus Securities and Exchange Commission, popularly known as CySEC and complies with PCI standards (Payment Card Industry) and AML (Anti-Money Laundering) Regulations. Additionally, Daweda also complies with the European MiFID (Markets in Financial Instruments Directive) guidelines. User-friendly demo account is available and anyone can login to experience the trading process. Verdict: Daweda as a pioneer in contract trading, has been constantly innovating to make system transparent and user-friendly as also ensuring minimum risk and maximum gain through educating its investors and guiding them.